The show of the 10th was prepared as a pre-recorded show because, while FCR has a new home – our temporary home prior being a tin box (think half a shipping container and you’ll be about right), we are currently in a shared studio, it’s actually the broadcast suite of Tangerine Studios, which is a recording/rehearsal space. All well and good, in theory. Unfortunately the building’s primary purpose must take precedence (it pays the rent). As such, Thursday evening sees a local band in the rehearsal space which meant the broadcast aspect was off the menu due to noise pollution – as it is intended to be a broadcast studio for bands in the recording/rehearsal space there was no requirement for expensive sound insulation. In essence, we are still looking for a permanent home for the FCR side of things. So, back to the show for the 10th that was ready to go as a pre-record event, which was just as well as we had a personal tragedy at home. Our beloved cat, Professor Yaffle, was hit and killed on the road outside our house Thursday lunch-time. 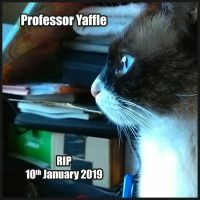 Suffice it to say we were (and still are to a degree) very upset, actually I was devastated, Yaffle had adopted me and was almost constantly at my side whenever I was in the house and eager to greet me when I’d been out, Thursday night for instance when back from the studio. As such, I would have been unable to present Fused live on the 10th. That and, coincidentally, other Thursday related issues (the day job encroaching) meant I wasn’t going to be available to do live shows until work related timings were resolved, hence the ‘sabbatical’ notice (admittedly a little OTT and premature – due to a broken heart and being a silly old Hector). Anyhoo, studio and real life/day job issues notwithstanding, Fused is looking good to be back at the regular slot on FCR; Thursday evening at 9pm (UK)!